Will things change from the ground up? Probably, but not during the next few years. 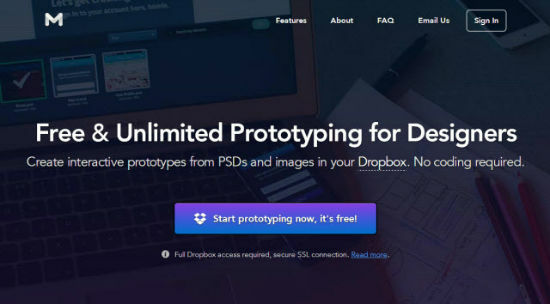 Prototyping with a visual touch is best done in Photoshop or other visually oriented software. At least as long as you are skilled enough to use them. With a tool such as Photoshop your prototype takes you only a idea and a little time. No code will be harmed during the making of this mock-up. The result, depending on your ideas, taste and skills, will definitely be more appealing than a simple wire-frame or a coded click demo. In the past I actually took Powerpoint for a ride, when a client demanded the prototype to be rudimentarily interactive. Need I mention, that this does work, yet isn’t a very straightforward solution? With the effort being relatively high, this mode of operation is restricted to larger projects only. The brand-new web and iOS app Marvel is a late entry to the game. But, better late than never. Marvel aims directly at designers who work the way I just described. Create a visual mockup in PSD (or other) and put it into your Dropbox. Other designers can also upload their PSD files to your Dropbox by using a Dropbox File Request. Then fire up Marvel and load the PSD into the app. Use simple tools to create hot spots and click targets. Add transitions and you’re good to go. You’ll find Marvel most useful, if you’re actually prototyping with Photoshop. While Marvel will work with a lot of different formats, it is able to natively read PSDs without the need to export them for the web. Simply store the PSD in your Dropbox and re-open it in Marvel to add functionality. Altering the PSD from inside Photoshop and saving the changes to your Dropbox leads to an automatic update of your Marvel mock-up. I’d call this a scoop.. Unfortunately Marvel comes with another show-stopper for many. Marvel requires full access to your Dropbox. No, Marvel is not a product of the NSA, yet who wants to have a third party app access all his files? Marvel’s creators are quick to promise that they would never even think of accessing any of your data, besides the files you proactively load into your Marvel projects. Still, I would never grant this permission. There is a way of using Marvel without potential sacrifices. Simply create a new, free Dropbox, dedicated to contain your Marvel projects. I wouldn’t have a problem giving Marvel full access to a Marvel-only Dropbox. The free storage plan should provide wildly enough space for any website prototype out there. Marvel’s creators promise to restrict access as soon as Dropbox’s API allows it, yet, for the time being, a separate “Marvel Dropbox” does make sense. I tried this a few times, feels like a SUPER low-quality rip-off of invisionapp.com – i’m surprised those people aren’t suing them! I guess the dropbox stuff could be cool, if I wouldn’t get fired for letting them access my ENTIRE account. I have to say I aways like the way Dieter writes these apps up. Looks really awesome, I’ve been using http://InVisionApp.com for prototyping and I really like all of the new features they’ve been releasing. I got a contract from a client just because they liked the prototype that much haha! Prototyping and Simulation are an important aspect of application design and development. There are many aspects of prototyping that are quite important to analysts, developers, managers, etc. and a good software is one that meets majority of requirements by end users. There are these great online platforms like Wix or Webzai that let you create landing pages/websites. These platforms have all the features to create the same website you will create as a prototype (and much better ones) in minutes, and, instead of a PSD you get an actual website. I really think designers (especially web designers) should start looking outside of their Photoshop bubble and make use of some of some of the other available (free) tools.